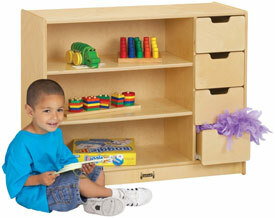 Stationary storage unit that helps organize large and small items with three generous shelves and four sliding drawers. 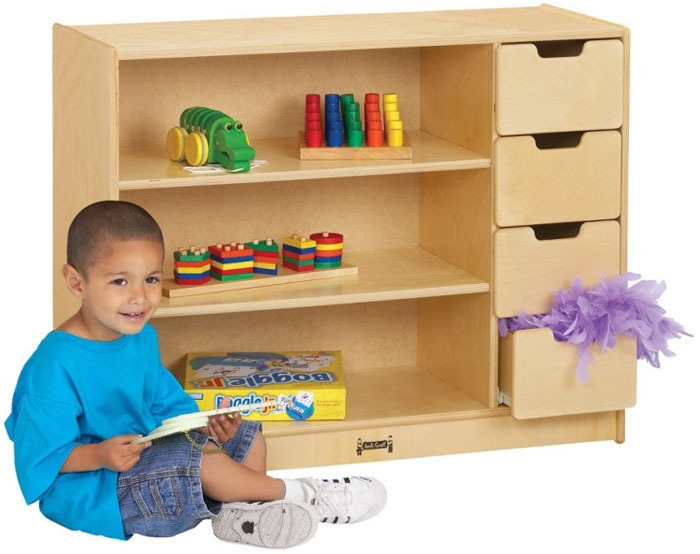 Shelves are 25½" wide x 13½" deep x 7½" high. Recessed, hardboard back. KydzSafe® rounded edges and corners. KydzStrong® construction. Extra durable, non-toxic and lead-free KydzTuff® finish that will not yellow. This unit ships fully assembled and includes a lifetime factory warranty. STORAGE MODULE: 36" Wide x 15" Deep x 29" High, Shpg. Wt.= 75 lbs.